After the winery we had no other destinations planned until Colorado. From where we were in Illinois to Denver Colorado is about 1000 miles. That would be at least three days for us, and comfortably four. We spent the first night at Mark Twain caves, where we've been before, right on the Mississippi River at Hannibal Missouri. They had a lot of rain and the little stream that passes through the campground was swollen and muddy. There was really no reason to stay so after we did a little bit of computer work we were back on the road headed west towards Kansas City. 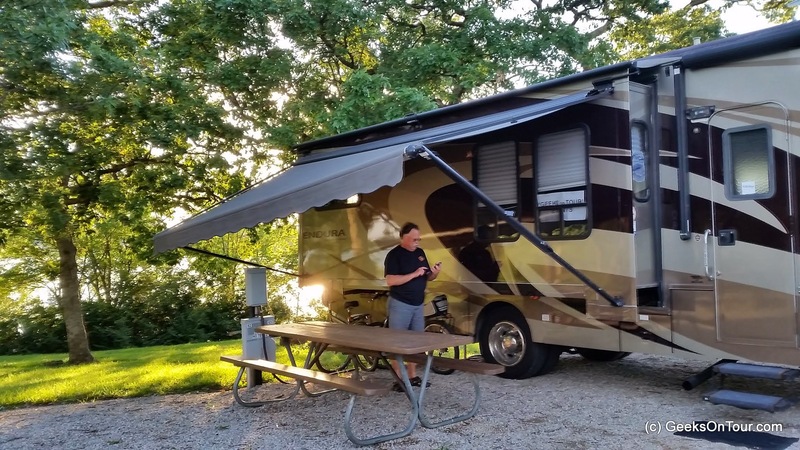 We made it as far as Topeka Kansas and, using our Allstays Camp and RV app on our smartphones we found a great little County Park called Lake Shawnee. 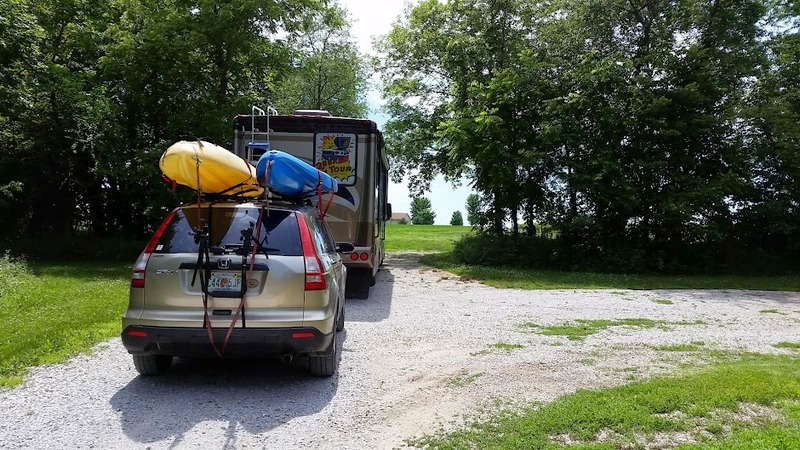 We were beginning to get a little road weary after 3 one-night stands in a row, so we decided to stay at Lake Shawnee 2nights. 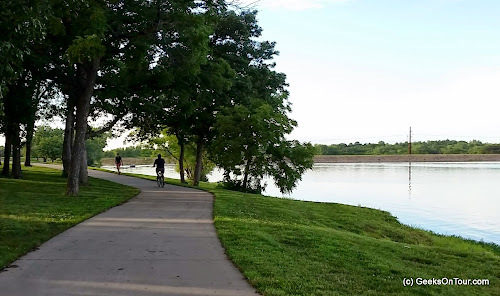 The best part about this park was bicycle trails that went for miles. When Our two nights were up we packed up again and heading west on 70 across Kansas straight and flat and boring. We spent one more night in Kansas and then back on the road and now are in Colorado. I like taking pictures of state signs when we cross the borders and I knew I already had one of Colorado, but I remembered it being very dull and saying that something about being colorful. I was hoping there would be a different sign on this side of Colorado but, nope, same dull sign announcing a colorful state! We had hoped to stay in our favorite Golden Colorado called Clear Creek so we called but were told that they had no space available. We weren't surprised. We had already consulted our AllStays app and found that there is a Elks Lodge just outside of Denver so that's where we headed and that's where we are. Actually quite nice and certainly less expensive than the Clear Creek. 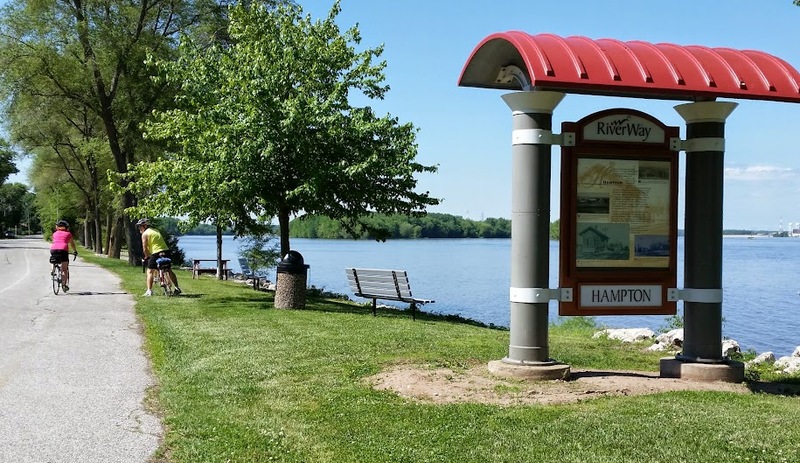 There's bar and restaurant right here, and it's an active RV park with about 30 sites. 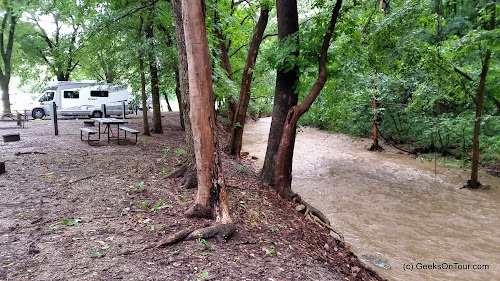 We might still try to get into Clear Creek for a few days after the July 4 holiday, but you can't beat $12/night vs $40! And, dinners for $5! We like Elks! Wow ... that was pretty cool! I created this blog post completely on my iPad using a free app called Blogsy. I'm still more comfortable using the computer wit Live Writer, and a full size keyboard, but Blogsy is a lot more capable than the Blogger app on the iPad. Creating the link was pretty easy. Getting my pictures from my Google+ web albums was a built in feature. And, I dictated some of the text rather than typing on my little keyboard. This all came about because of a Geeks on Tour member who asked a question in our Forum. In researching the answer, I found Blogsy. It's pretty nice - I'd even dare to call it the "Live Writer of the iPad." The next night we had already planned to be a Harvest Hosts location, a winery. Not only did we get a nice place to park with a view of vineyards out our bedroom window and a wine tasting, but it was Saturday night and they had a musical group scheduled as entertainment that night. First, let me show you the location. The RV parking area is through the trees in the grassy field by the vineyard. A storm rolled in during the late afternoon, making for some dramatic views over the vineyards. Tornado warnings were on the weather channel, but didn’t quite reach our location. After getting parked and set up, we went to the winery for a tasting. This is Kayla – to see more from her, you gotta check out their website and watch the “Sipcom” called Up the Creek! And, we took advantage of the beautiful grounds for a little R&R. We had to get some computer work done, so we went back to the RV to find that there was NO Verizon signal here. They did have Wi-Fi inside the winery, so Jim put up the WiFIRanger external antenna to see if we could get it out in the RV. Yes! It still wasn’t great, but we had nothing without it. After a salad dinner, we walked back to the winery to get a bottle of wine and some cheese and crackers to go along with the entertainment. 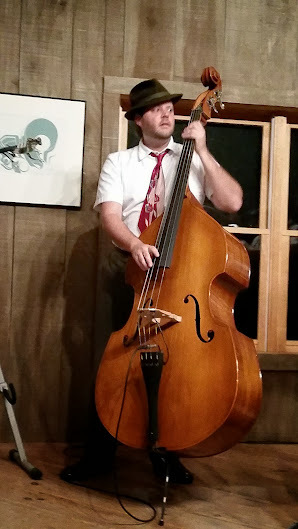 Victor & Penny and the Loose Change Orchestra (the clarinet and stand-up bass.) Be sure to check out their Facebook page and make it a point to go see them if you ever notice them nearby. That’s “Victor & Penny” … actually Erin and Jeff. 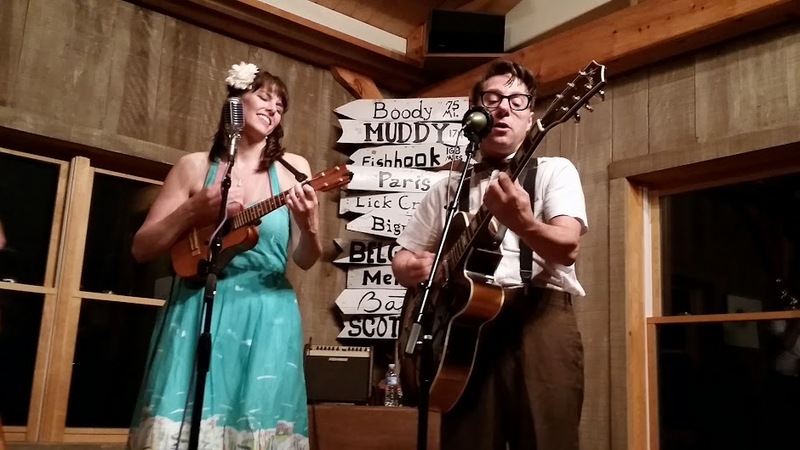 Their music is unique – they call it “Antique Pop.” Music from the 30s and 40s like “Side by Side” but with their own high-energy, upbeat take on it. We thoroughly enjoyed it. 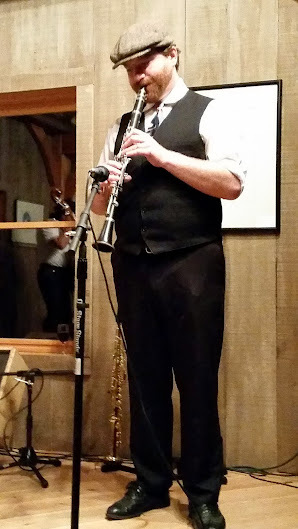 They were also accompanied by the “Loose Change Orchestra” which included a clarinet and stand up bass. Excellent musicians all. As much as we enjoyed their music, we enjoyed meeting them and chatting the following morning even more. Here we are taking a little tour of the winery. Notice that Jeff is using a GoPro to film it. They live a lot like us because they are on the road all the time, but they travel by car and stay in hotels. We made them come out to the RV and contemplate living with a home on wheels. More pictures on our June Web Album. So, the plan was to leave Saturday and drive our normal 200 miles to a winery on the Harvest Host list just east of Champaign Illinois. But, when the service guys came up to us on Friday in the early afternoon and said, you’re all done! We decided to leave then and go to a closer Harvest Host destination … the Grissom Air Museum. And, we’re so glad we did. We got there in the early evening, parked in the lot, turned on the generator and worked on our computers for a little bit. There was no Verizon signal there, so we took advantage of the AT&T connection on our iPad and turned that into a hotspot for our computers. We’re happy to report that this worked well! Often, when there’s no Verizon signal, there isn’t any AT&T either, but luckily, that wasn’t the case here. By sunset time, we were ready to go outside and walk around. Such cool photo opportunities! The next morning, we were ready to take a look around after they opened the doors at 9am. Luckily, it was Saturday, so they were fully staffed and offering tours. Lots of exhibits inside where you could climb on the old planes. Then we climbed the tower to get a birds-eye view and used the Panorama feature on our Samsung phones to take it all in. If you look closely, in the upper left, you’ll see our RV parked in the lot. Later, inside the museum, we met Roland Douglas. He’s a native of Peru, Indiana where the museum is located and he is a veteran of WWII. Here he is standing in front of the display that tells his story. He was a gunner in a B17 that was destroyed over Germany in 1944. He parachuted and was captured as a prisoner of war. He told us all about it. Lots more pictures in our June Web Photo Album. I hate backtracking, especially when that means traveling the highways on the south side of Chicago. The teeth-jarring toll-charging Interstates. You see, our original plan looked like the map below where #1 is the INTO Rally in Lebanon, TN, #2 is the Escapade in Goshen, IN, #3 is a week with the Quad Cities Computer Club, and #4 is the Fleetwood Rally in Duquoin, IL, and then we would be headed west. Something happened to #4 and they combined with the Glamarama rally in Goshen … same as #2. So, we had to drive from #2 to #3, then back to #2. On some of the worst roads in the country. Now we’re planning to head back west, and it would be logical to go thru #3 again, but I do not want to travel that road again! Other than that, the rally was ok. You would think that having a double-rally would give us bigger audiences but that didn’t happen. 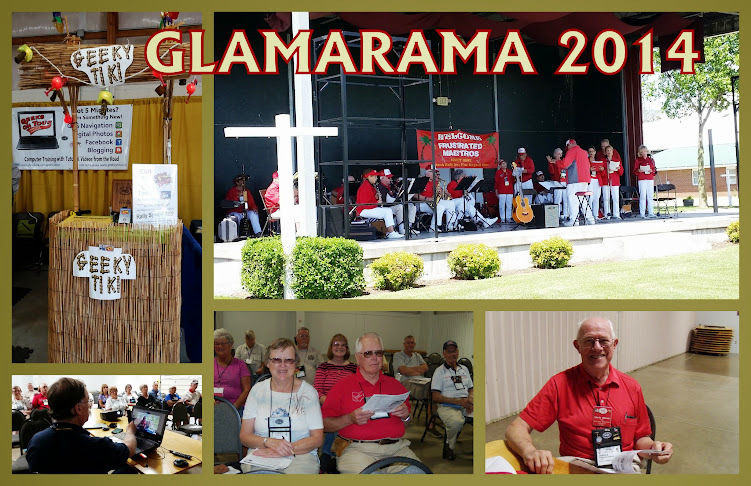 The Glamarama rally already had a Tech-guy covering some of the topics we normally do (Smartphones, Websites, Windows 8, and GPS/Mapping software), so they didn’t schedule us for anything more than we had already agreed to do for the smaller Fleetwood rally. The good news is that we had a booth and we had lots of time to chat with people – reconnecting with old friends and making some new. Here’s old and new in one photo! 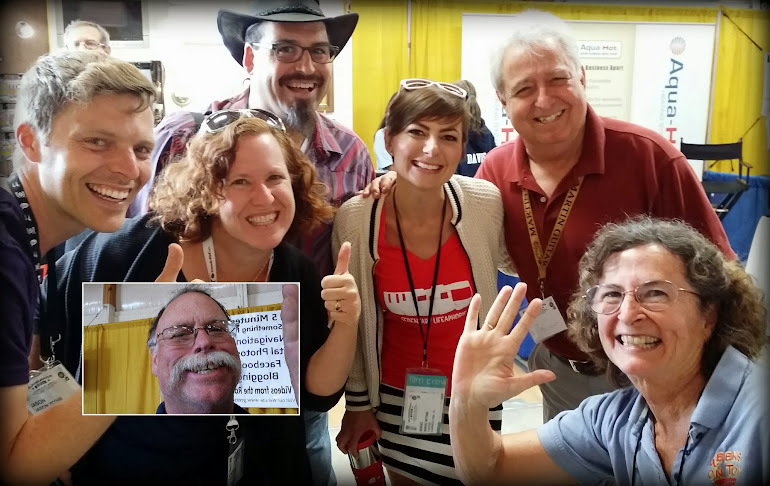 From left to right: Jason Wynn, Cherie Ve Ard, Chris Dunphy, Nikki Wynn, Gary Bunzer, Me, and Jim in the inset. To learn more about these folks, see GoneWithTheWynns.com for Jason and Nikki, Technomadia.com for Chris and Cherie, and RVDoctor.com for Gary Bunzer. We also had the pleasure of presenting a seminar for Harvest Hosts. 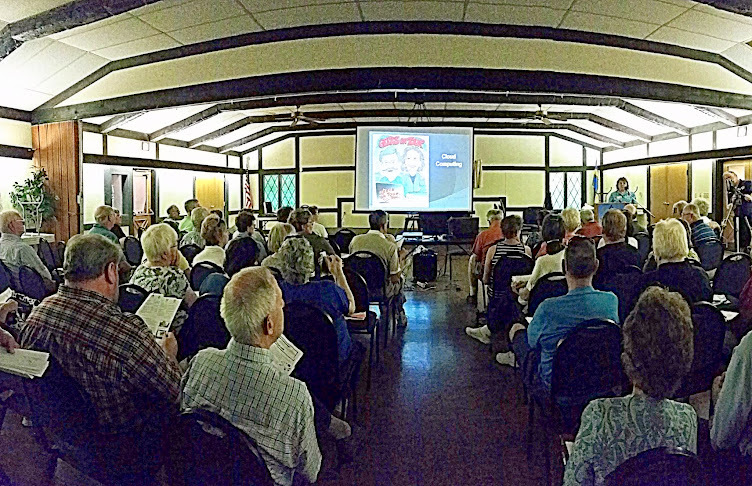 We arranged this several months ago when we heard they wanted someone to do the seminar for them because they needed to be in Arizona at this time. We think Harvest Host is something that every RVer should join and use. 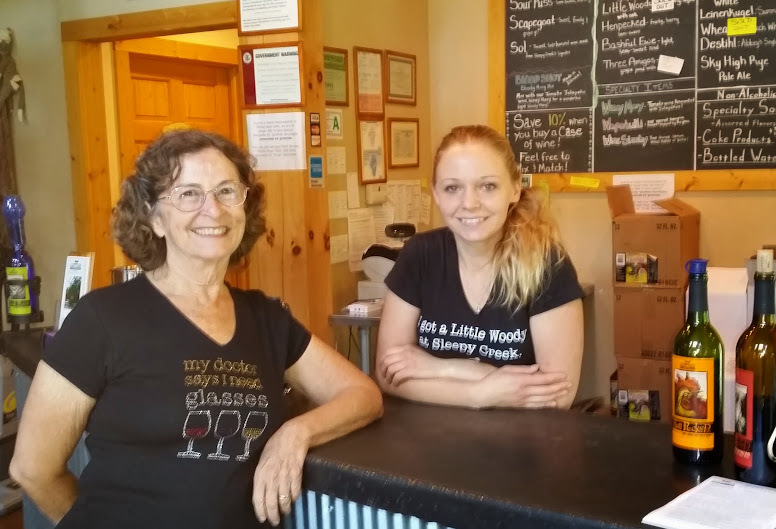 With a $40/yr membership, you get to stay at wineries and farms all over the country – no charge, except what you pay for wine! We’ve stayed at two so far, and they were both delightful. Presenting the seminar rekindled our own interest and we’ve pinpointed a winery about 4 hours from here to be our first stop after we leave. We’ll be headed south in order to avoid that route by Chicago! 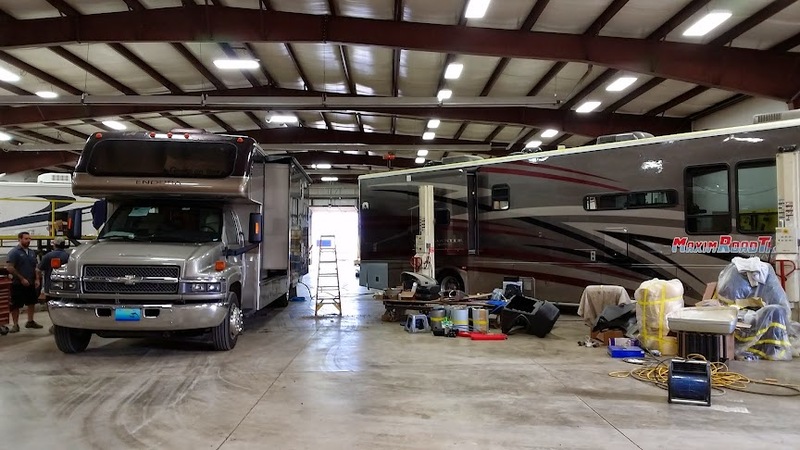 Right now, we’re staying in an RV service center to get our slide fixed … again! This time we’re at Master Tech in Elkhart, IN. 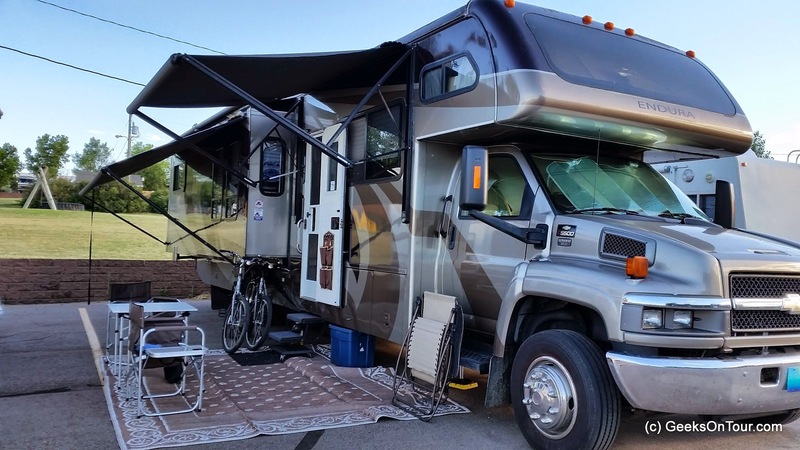 We’ve heard really good things about them by several RVing friends recently. And, they’re proving to be good for us as well. The problematic slide was fixed in the first few hours we were there, it just needed some adjustment between the front motor and the rear motor so it came in and out evenly. We blame the roads for knocking the slide off its gears. But then we said “Just take a look at the other slide as long as we’re here.” I thought maybe it just needed some lubricating because it made such a grinding noise when it went in and out. 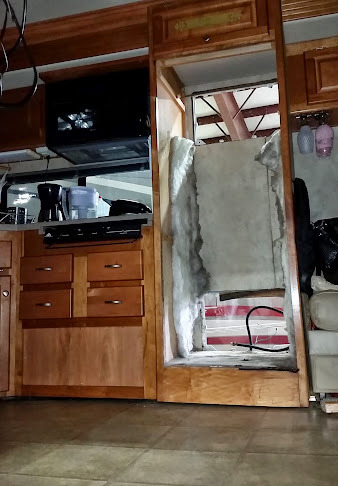 They noticed that the refrigerator was a little lopsided and it is in that slide – to fix that, they need to take the refrigerator completely out, remake the wooden frame for it, then put it back in. They worked on that all day and still aren’t done. Meanwhile, they also noted that the slide-toppers – the awnings that just cover the tops of the slides – were in pretty bad shape. They could order new toppers and they would be here in a day, then take a day to install. <<sigh>> Yeah, we know they need to be replaced, and yeah, we might as well get that done when we’re at a good place. So, what started out as a few hours and a few hundred dollars has turned into several days and a few thousand dollars. Ah well, it feels good to get these things done. It makes me happy to see signs like this in public places! It makes me even more happy when we follow those signs! We took a day off from any kind of work, got out the bicycles and joined our fellow fulltime RVers, Steve and Karen Fisher for a day of bicycling and sightseeing. 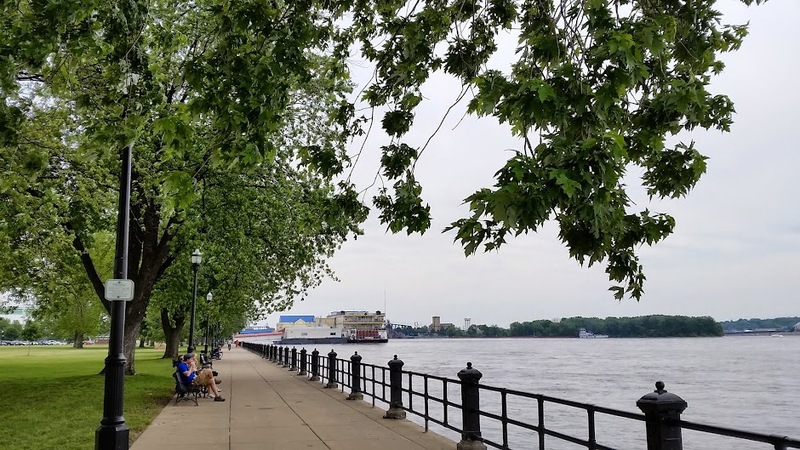 There’s this great bicycle trail all up and down this area of the Mississippi river, and we had the most perfect, sunny, cool, sparkling, day for it! We rode down river to a bridge that took us over to Rock Island. This is where the US Army’s Arsenal is located. There is also a visitor center for the Corps of Engineers and their many locks and dams on the Mississippi river. A lot of barges go thru this lock, and we had a good vantage point to watch. How do you like this animated picture? If you want to know how we did that, there’s a video on the process on our website: Google+ Auto Backup and Auto Awesome. 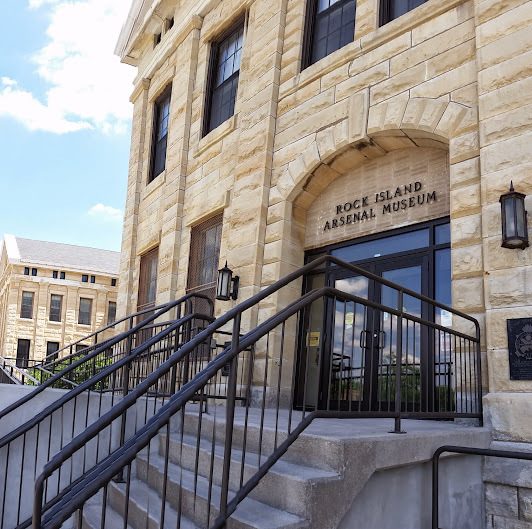 We also visited the Arsenal Museum on the island. Pretty impressive place. It’s where all the guns, amunition, tanks, and other supplies of war have been made for the US Army. 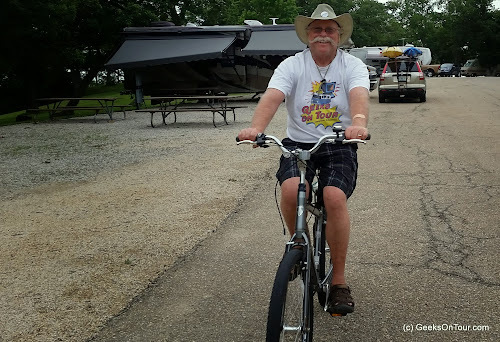 By the time we got back to the RV that afternoon, our Runkeeper app on on phones had recorded a bicycling distance of 27 miles!! I didn’t know I was capable of that. The next day, we went to the Farmer’s market over in Davenport. We met up with Vicki, our computer club contact and her husband Lee. 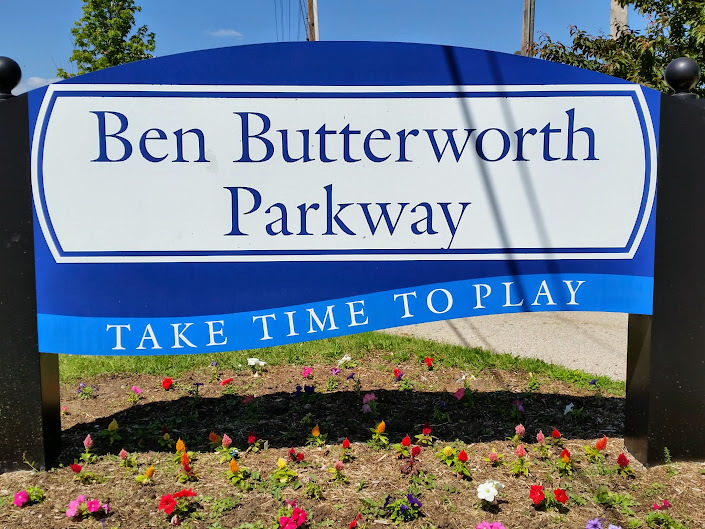 We picked up lots of good fruits, vegetables, and bison meat, then followed Vicki to take a look at Bix Beiderbecke park. Bix was quite a famous musician from these parts, and Vicki told us of how her Dad used to play with him. 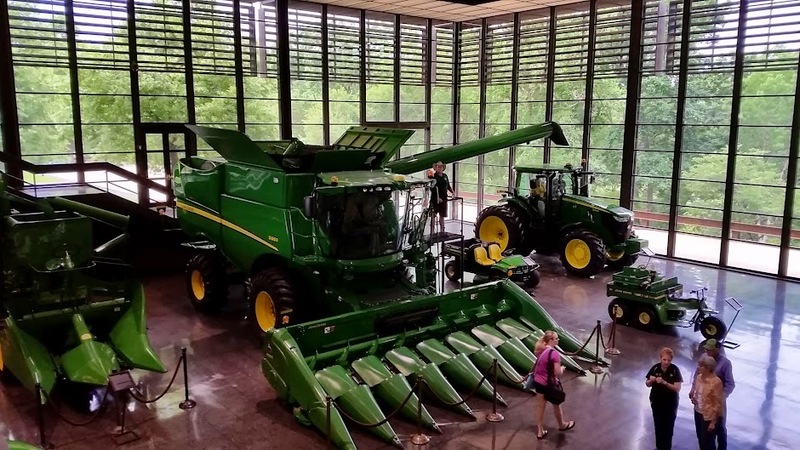 Then, we finally made it to the John Deere pavilion. 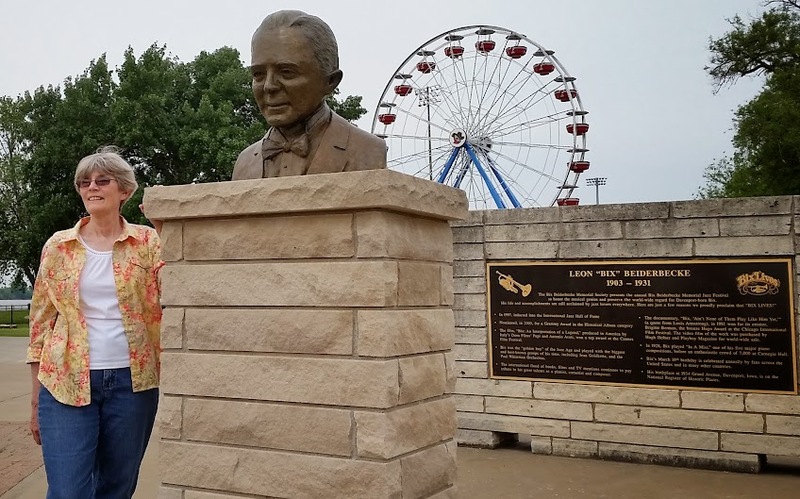 This is our third trip to the Quad Cities, and each time we’ve been told that the John Deere Pavilion is a must-see, but we haven’t made it. So Lee said, “Follow us” and we did. 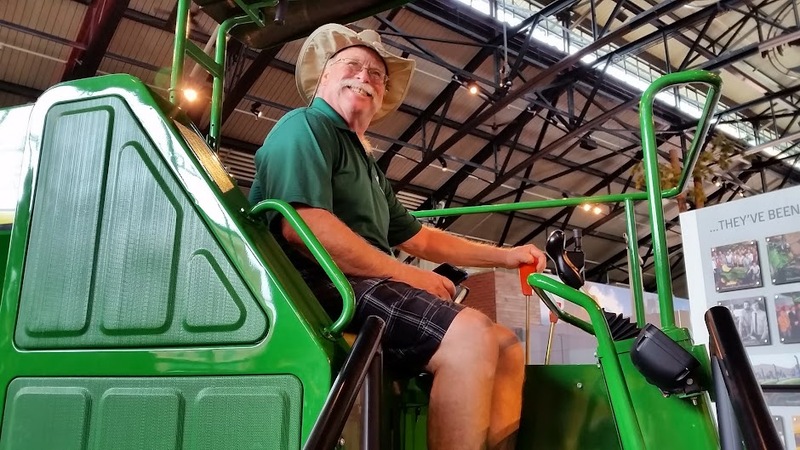 You could climb all over tractors and other heavy equipment, but the really fun part was the computer simulations. I chose the earth mover and I had to operate the controls to position the shovel, lower it, scoop up earth, then raise the shovel, move it and drop the dirt into a waiting dump truck. By the end of my time it showed that I had filled the truck 7%, and had done $963 of damage to the equipment! I don’t think I’ll get hired as a heavy equipment operator any time soon! 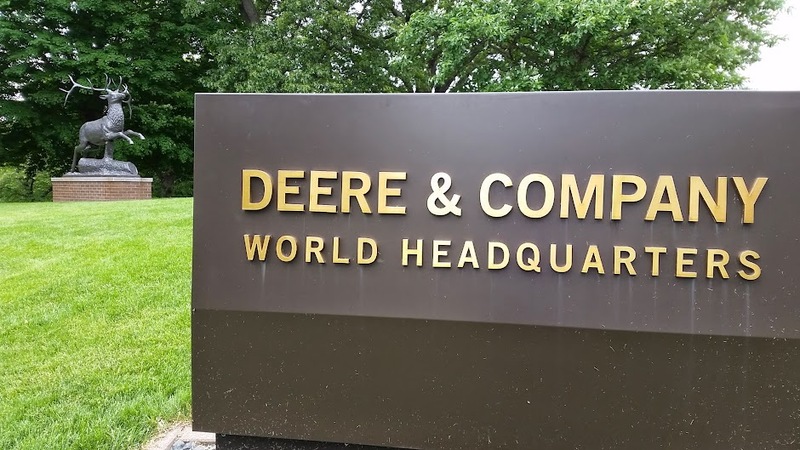 Next we went out to the John Deere Headquarters on the outskirts of town. Beautiful grounds and very impressive buildings. After two days of play, we had to get back to work at our computers … and rest! Look who came to visit! Lynne had a day off, and she was within a 5 hour drive of us, so she took the opportunity to come visit. I know she just likes to have an excuse to go for long rides in her sweet little BMW convertible! It was great to see you Lynne! Adding Work to Personal Blog, or Getting Personal with Work Blog? …I finally decided that it's both. That is a great thing about our lives, we blend personal and business. We love what we do and we do what we love, and we write about all of it! But that was before we had our Geeks on Tour website with so many articles about our technology teachings. Now, it’s pretty clear that if you want to learn about technology from us, you go to our business website. If you want to follow our RV travels, you come here to our personal blog. That works great until I feel like writing in detail about the seminars we do. I decided to do just that after the Escapade rally, and it turned into an epic-length post that I’m not at all sure belongs in our personal travel blog. I’ve considered posting the exact same post as an article for GeeksOntour.com (easily done using LiveWriter!) but that didn’t really fit either because those articles are primarily teaching articles about specific technology topics. This was more about the personal details of our work life. I’ve been stuck – do I want to write more about our work here in the personal blog, or do I want to get more personal in our work blog? What do you think? Too much? Not enough? I could do more! This past week we taught four different classes to various audiences. It was different because it did not involve RVers at all. Here’s the Quad City Computer Club monthly meeting where we presented our seminar on Cloud Computing. Here’s the article I wrote on the new Blog: Our Cloud Computing Class Evolves. That was Monday night. 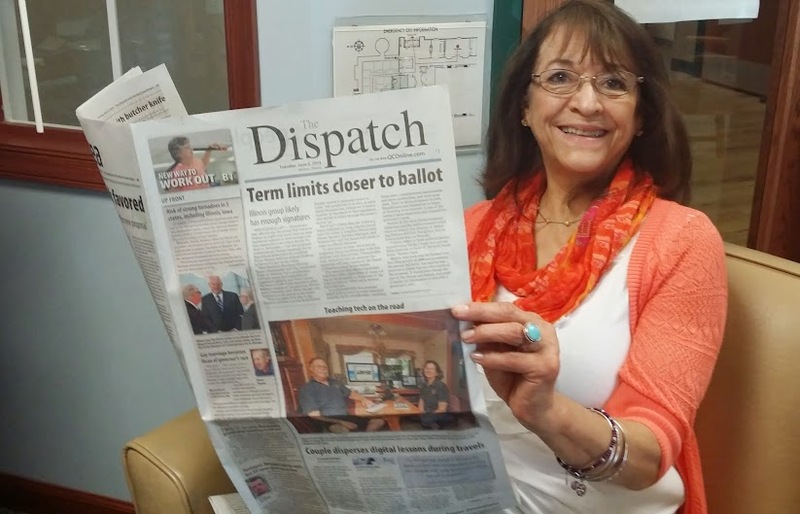 Then, on Tuesday, we taught a seminar we called “Making a Free Website using Blogger and Picasa” and we taught that one at the CASI Senior Center in Davenport, Iowa. We sure would like to do this seminar more and more. We love our blog and think everybody should have one! Here’s the article I wrote in the new Blog about that class: Web Albums, Blogs, or Both? 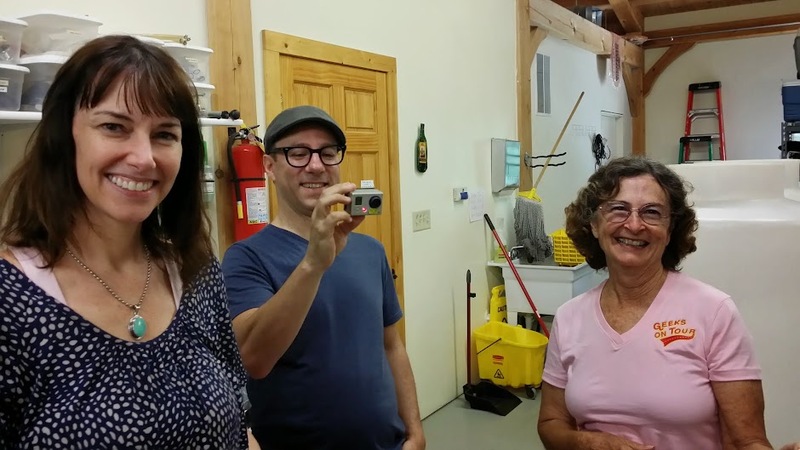 On Wednesday evening, we taught a hands-on smartphone photography class. I haven’t written a separate article on that yet, but I want to because it’s a great class and, I have some ideas on how to make it even better. 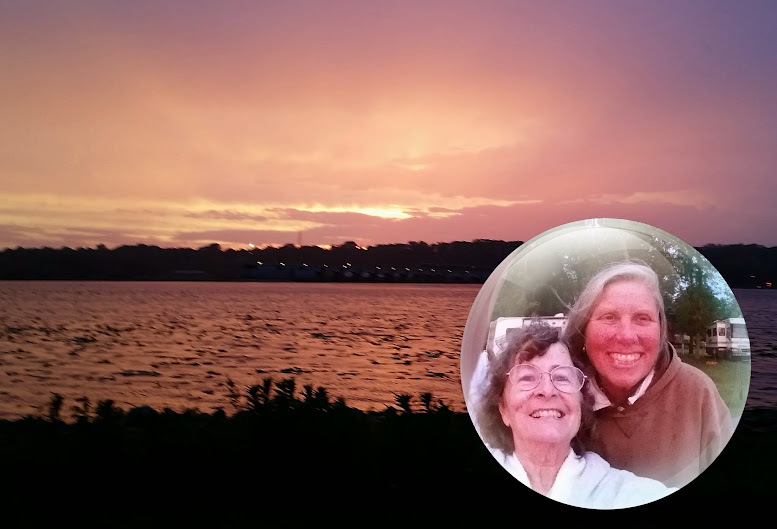 Last, but not least, we taught a hands-on photo editing with Picasa class – also at the senior center. This was just for 6 people and we don’t have any pictures to show you. We had a miscommunication for this class and only 2 people brought their laptop computers! Kinda hard to teach a hands-on computer class with no computers! But we did it anyway, just doing more demonstration than we normally do! Everyone said they learned a lot, and they all became members after class, so they would have access to all the tutorial videos on Picasa! It was a very successful work week. We taught a lot, we learned a lot, we got our picture in the paper, and we made some money! We welcomed 17 new members to Geeks on Tour. A Big Thank You to Vicki Wassenhove for inviting us and making all the arrangements. Also for the great photos!